The other day I was given a Myer Gift Card to the value of $100. The gesture and gift was welcomed but not very useful. The card cost the buyer $100 (There was no discount on offer – $100 for $100 card only). Now there is not much I consider to be of interest or of value worth buying in Myers, so the gift card represented a bit of a problem. I was thinking of giving it away but it got me thinking about gift cards per say and the problems associated with them and why they are not worth purchasing or giving away. A store restricted card, such as a Myer Card, is of limited benefit to the person who is the receiver of the gift. You are forced into spending it in Myers. The only one that benefits from the card is Myers. What’s more they are a one time use card that you are just throw away when finished and they add to the rubbish and environmental pollution. Not even Myer’s value it. 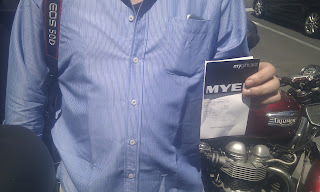 I tried to exchange the card for a more friendlier card a Coles/Myer/Office Works gift card. One that could be used in places that I am more likely to spend. Unfortunately Myers would not accept the card as legal tender to buy the alternative card . Stuck with a Myer gift card, a gift card from hell, a card I could not use or exchange for another gift card sold in their store. I ended up selling the card outside of Myers at a discounted rate. Some 30 minutes later and a lot of protest at what I consider to be an unfriendly, unhelpful store. I am told they sell on eBay for $85-$90. I was more interested at the time what others thought it was worth. I did turn down a offer of $20. The $100 card was eventually sold for $50. (Photo of Jack the successful buyer – I hope it gives him more satisfaction then it gave me). This brings me back to the question of gift cards and what a company, relative or friend can offer as an alternative. A training voucher, a card that has broader appeal, a petrol voucher or even a Paypal or Myki card would be a better gift. If you thinking of buying a gift card. Think again. Think about the environment and do not purchase or offer a Myer or store gift card. Oh if your interested I intend to place the $50 in the church box. A charity gift card, if there is one, would be of more interest. Myers is not a charity. Myers Melbourne to scale down City outlet amidst concern that City retail is in serious decline. News realised today indicates that Myers, Melbourne’s iconic retail outlet has decided to close down its Lonsdale Street outlet with hundreds of jobs set to vacate the city center. Myers decision comes as no surprised as suburb outlets and problems associated with traffic access and parking in the city centre undermining the viability of Myers premier store. Questions are being asked as to what action plan the City Council has to fill the void that will be left standing as yet another major city site faces the prospect of remianing vacant. teh scaling down of Myers will also have a flow on effect to other city business who rely on passing trade and custom from Myers workers. We can soon expect more announcements of City retail outlets calling it a day and vacating the City Center.